[147 Pages Report] The loyalty management market is projected to grow from USD 1.68 Billion in 2016 to USD 4.59 Billion by 2021, at a CAGR of 22.2% from 2016 to 2021. Rising need for competitive differentiation among organizations to increase their market shares is the major driver expected to fuel the growth of the market during the forecast period, 2016 to 2021. Moreover, frequent shift in consumer demographics, increasing focus of loyalty programs on customer segmentations, significant rise in the use of mobile technologies, and increase in the number of cardholders are other factors expected to contribute towards the growth of the market during the forecast period. The main objective of this report is to define, describe, and forecast the market on the basis of type of solution, deployment type, organization size, vertical, and region. The report provides detailed information about the factors, such as drivers, restraints, opportunities, and industry-specific challenges influencing the growth of the market. The report aims to strategically analyze each submarket with respect to individual growth trends and contribution towards the overall market. It also aims at analyzing opportunities for stakeholders in the market, along with detailed competitive landscape of the market leaders. The report attempts to forecast the market size with respect to five main regions, namely, North America, Europe, Asia-Pacific (APAC), Latin America, and Middle East & Africa (MEA). The report strategically profiles key players and comprehensively analyzes their core competencies. This report also tracks and analyzes competitive developments, such as acquisitions, partnerships, new product launches, and R&D activities in the market. The ecosystem of the loyalty management market comprises vendors, such as Oracle Corporation (U.S.), IBM Corporation (U.S.), SAP SE (Germany), Aimia Inc. (Canada), Comarch (Poland), Bond Brand Loyalty (Canada), Brierley+Partners (U.S.), Epsilon (U.S.), ICF International, Inc. (U.S.), Kobie Marketing, Inc. (U.S.), TIBCO Software (U.S.), Maritz Holdings Inc. (U.S.), Fidelity Information Services (U.S.), MicroStrategy, Inc. (U.S.), and Lumata Group (U.K.), among others. Other stakeholders in the market include vendors of customer loyalty solutions, employee retention and recognition solutions, channel loyalty solutions, and customer analytics solutions. “Study answers several questions for the stakeholders, primarily which market segments to focus on, during the next two to five years for prioritizing their efforts and investments”. This report provides detailed insights into the market, which has been segmented on the basis of type of solution, deployment type, organization size, vertical, and region. On the basis of deployment type, the market has been classified into on-demand and on-premises. The on-demand deployment type segment of the market is expected to grow at the highest CAGR during the forecast period. The growth of this segment can be attributed to increased adoption of on-demand (cloud-based) loyalty management solutions by various organizations across the globe. The advantages offered by on-demand deployment of loyalty management solutions, which include low infrastructure costs and improved output with qualitative results are the factors fueling the growth of the on-demand deployment type segment of the market. Among verticals, the BFSI segment is expected to lead the of the market during the forecast period. The BFSI industry vertical is utilizing the power of loyalty programs to enhance its customer satisfaction. With increase in mobile technologies, such as mobile banking and increase in the number of cardholders, organizations in the BFSI industry vertical are expected to adopt loyalty management solutions to offer enhanced customer experience and increase loyalty of their customers. Among solutions, the customer loyalty segment is projected to lead the loyalty management market during the forecast period. The growth of this segment of the market can be attributed to increasing adoption of customer loyalty management solutions by various organizations to measure and monitor activities of their customers as well as segment them on the basis of their extent of loyalty and value addition towards businesses of these organizations. The employee retention segment of the market is projected to grow at the highest CAGR during the forecast period. The growth of the employee retention segment of the market can be attributed primarily to additional cost incurred in the acquisition of new employees by varied businesses and increase in employee satisfaction through attractive reward programs. 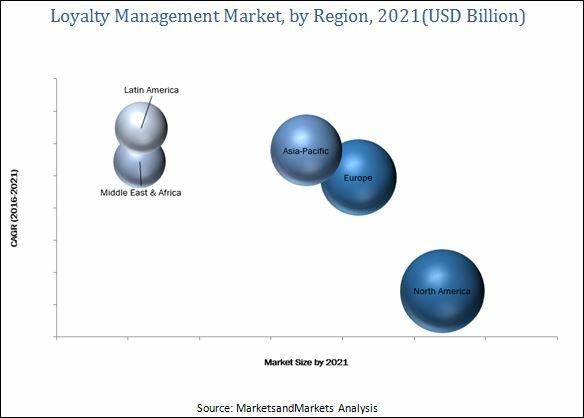 On the basis of region, the loyalty management market has been segmented into North America, Europe, Asia-Pacific, Middle East & Africa, and Latin America. The North American region is estimated to account for the largest share of the market in 2016. The growth of the North America market can be attributed to the advancements taking place in the region, in terms of mobile technologies. The smart phone market has matured in the North American region and at present, most of the consumers are using various mobile apps to carry out varied transactions. Thus, top vendors are offering technologically advanced loyalty management solutions, specifically for mobile apps. The Latin America market is projected to grow at the highest CAGR during the forecast period. The growth of the Latin America market can be attributed to increased card transactions particularly in developing economies, such as Brazil and Mexico and increased investments by customers in various benefit options and vouchers. Offline players are also establishing different online stores to pursue online consumers with collaborative incentive programs. Complexity in data synchronization and subjective expectations of customers are some of the factors expected to restrain the growth of the loyalty management market. Most of the vendors have adopted agreements, collaborations, and partnerships as key strategies to enhance their client base and improve their customer experience management offerings. Oracle Corporation (U.S.), IBM Corporation (U.S.), SAP SE (Germany), Aimia Inc. (Canada), Comarch (Poland), Bond Brand Loyalty (Canada), Brierley+Partners (U.S.), Epsilon (U.S.), ICF International, Inc. (U.S.), Kobie Marketing, Inc. (U.S.), TIBCO Software (U.S.), Maritz Holdings Inc. (U.S.), Fidelity Information Services (FIS) (U.S.), MicroStrategy, Inc. (U.S.), and Lumata Group (U.K.) are some of the major players operating in the market. These companies have adopted both, organic as well as inorganic growth strategies to strengthen their position in the market. For instance, Aimia Inc. has focused on developing strategic partnership with SAS Canada, a leading software analytics company, to enhance its data analytics capabilities to offer improved loyalty management to its customers.